Jammu & Kashmir independent MLA Engineer Rashid, on 20 October, lashed out at the extremist groups and accused them of killing Mahatma Gandhi's 'tolerant' views. Rashid, who was attacked with ink by the Hindu Sena activists outside the Press Club of India on 19 October, said Mahatma Gandhi sacrificed his life to prevent communal riots. "He always stressed on Hindu-Muslim unity. If we get Gandhi's India today then at least we will feel that justice prevails. We don't want Nathuram Godse's, Mohan Bhagwat's, Sakshi Maharaj's or Praveen Togadia's India because we have already suffered a lot," Rashid told ANI. "The job of a Prime Minister is to keep the nation united. Unfortunately, if the Prime Minister does not wake up even now then nation will suffer," he added. Rashid welcomed President Pranab Mukherjee's remarks on rising intolerance in the country. "If President is saying such things then it means that he has taken note of it. I hope those people for whom he (President) has said such things would understand the same," he said. President Pranab Mukherjee had yesterday expressed apprehension whether tolerance and acceptance of dissent are on the wane and said that humanism and pluralism should not be abandoned under any circumstances. 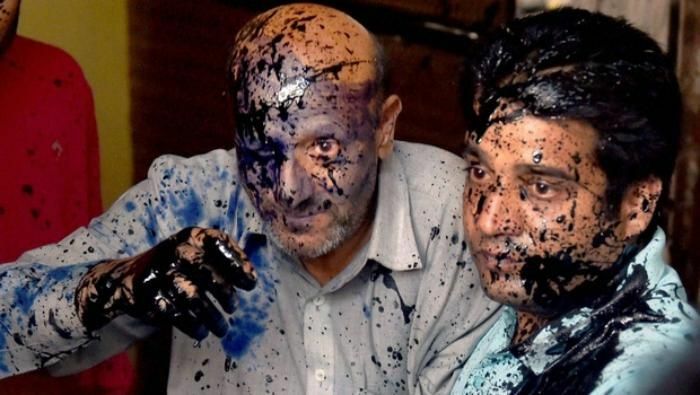 The ink attack took place when Engineer Rashid had called a press conference in the national capital. The Hindu Sena had claimed responsibility for the attack on Rashid alleging that the independent legislator from Langate has insulted cow, considered sacred to Hindus. Rashid was last month beaten up by the BJP MLAs inside the Jammu and Kashmir Assembly for allegedly hosting a beef party.